I guess you can say I'm getting excited about my new Avax XC2 which is scheduled for delivery in February. 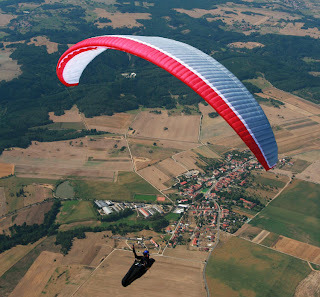 Go to http://www.paraglidingheadquarters.com/avax%20xc.html for the complete write-up, photos & specs. The long awaited performance glider AVAX XC 2 is here. AVAX XC 2 has been tested extensively over a long period of time and by a variety of pilots before being presented to the jury. All Sizes 2passed EN (European Norm) as C rated gliders http://www.para-test.com/ what is rating roughly corresponding to DHV 2. Gradient, however, suggests this glider should be treated more like DHV 2-3. AVAX XC 2 is a typical representative of the latest performance gliders with parameters close to comp machines. It has a formidable aspect ratio 6.38 and a high number of cells (73) to assure a clean shape of the airfoil. Its weight has been kept very low: size 28 weights only 5.8 kg. As usual, Gradient is not trying to dazzle the market by amazing performance data, but anybody experienced with Gradient gliders knows what to expect. Just making sure there is no misunderstanding: The AVAX part of the name is no indication this glider is a down-tuned comp machine. AVAX XC 2 has been developed independently from the scratch as a performance glider and there are no compromises. This should be glider for demanding recreational XC pilots and aspiring comp enthusiasts. I also came across a video of 4 Avax XC2s flying at a great Czech site. . .My wing is either going to be the Grey/Red combo or the "Sangria" combo Red with Black leading edge. I promise this is the last bit of excited gushing I'll do until I fly it - unless I get more info . . .
Well, I made the jump. I've gone out on a limb a bit & I'm sure I'll have some stories to tell about my experiences. . . Thanks to my wife, Mary, giving me the green-light, today I ordered a NEW wing - not only new to me, not only new - as in NOT USED. But I ordered a NEW wing - as in nobody has one in the US yet. I've moved from my Aspen2 to the new (have I mentioned it's new ;-) Avax XC2. This is Gradient's highest performance certified glider. I will have one of the first wings to be flown in the US & hope to do it proud when it arrives in February. I'm pushing my personal envelope a bit & will be cautious, but all the early flight reports indicate that the Avax XC2 flies very much like my Aspen 2 and has the light handling characteristics that Gradient wings display. It has been certified under the new CEN criteria as a CEN 'C' glider. This certification is quite impressive, as it indicates that the handling of the XC2 should be comperable, in skill required, as my Aspen 2. The forecast performance will increase my glide ratio by 10% and speed by over 10%, so it should make it more possible for me to keep contact with the leading gaggles during competitions. This wing will, in no uncertain terms, allow me to evaluate MY performance during a competition without having to factor in a 'penalty' for the wing's deficiency in performance - No excuses. . . I've put off moving to a wing of this performance for a while because the higher the performance class & speed, the higher the skill necessary to keep the wing in shape & over my head. I will conservatively fly this wing in the upcoming season & feel my skills will keep me out of trouble. 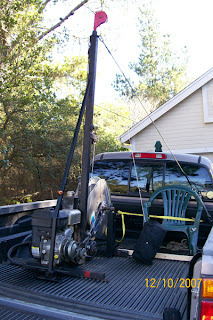 One of our local instructors, Tom M. has taken delivery of a used winch. He has plans to install it in his ski boat so we can fly at Lake San Antonio. I love the idea (since I got a taste of some real acro at my SIV course in Oct.) I went to his house, last weekend, & helped him modify & weld the unit so that it would fit into the boat. 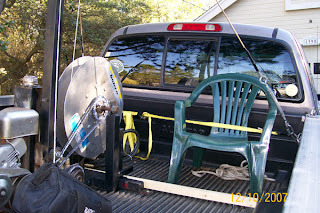 When finished with the mods, I mentioned that it might make sense to try the winch out in my truck to eliminate the natural "fiasco factor" that is added anytime you involve a boat in an endeavor. Tom responded enthusiastically, so we drilled holes in my Tundra & mounted the unit. I chopped the legs off a lawn chair to use as a control operator's station, which worked surprisingly well. Sunday afternoon we scouted for the perfect site to test the rig. We didn't find that site, but settled for a dirt road out in East Nipomo. Tom laid out his wing & Peter drove while I manned a hydraulic valve that I was completely unfamiliar with. Now we need to get comfortable with its use & finish the installation in the boat. We also need to find excellent spots to tow on land.